Domestic oil production in the United States may reach an all-time record in 2018, according to a new forecast from the federal government. “Domestic oil output is expected increase to an average of 9.7 million barrels per day next year led by increased drilling in the Permian shale region of Texas and New Mexico and from rising production in the Gulf of Mexico, breaking the U.S. total annual production record set back in 1970,” said Howard Gruenspecht, acting head of the U.S. Energy Information Administration (EIA). 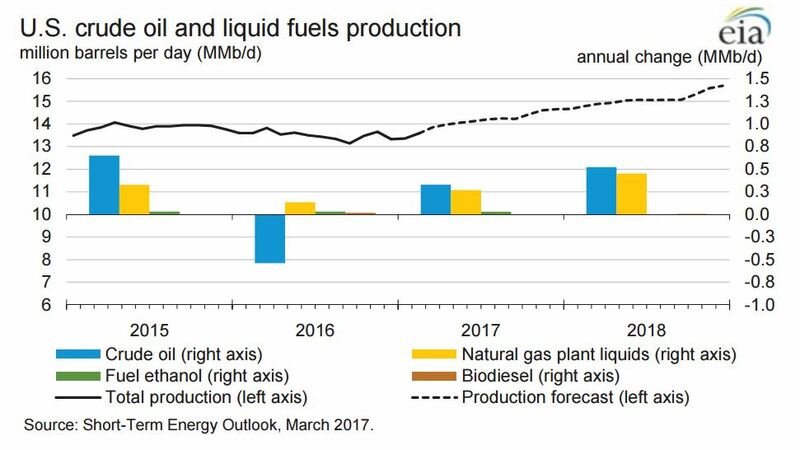 The EIA’s Short-Term Energy Outlook for March also predicts U.S. production will have more influence on crude oil prices for the remainder of this year compared to actions taken by Organization of Petroleum Exporting Countries (OPEC). “Rising crude oil production from non-OPEC countries, especially from the United States, is expected to curb upward pressure on oil prices for much of 2017,” Gruenspecht said in a statement. 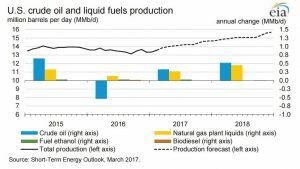 The EIA’s new outlook, released last week, increased the 2017 and 2018 forecasts for U.S. oil production by 200,000 barrels per day. “The higher forecast reflects improvements to forecasting methodology for rig efficiencies and an expectation of a more rapid near-term increase in drilling and completion activity, particularly in the Permian region,” the EIA report said.